Our solar thermal system is designed to heat our water for our domestic hot water supply and also has what is called a heat assist system that is designed to pre-heat the air prior to it going into our furnace, which is powered by natural gas. The system is over sized for the summer (as we only need hot water in the summer), but the extra capacity is designed for heating our home in the winter. It offsets about 70% of our hot water heating in spring, summer and fall and offsets about 70% of our home heating in the fall and spring and about 50% in the winter. In addition, we changed out 2 two-zone HVAC systems for 1 four-zone high efficiency system that only heats and cools the floor we are on. So we have two of the floors we are rarely on to “off” and have the other two floors set to the specific times were are mostly on the floor. I wanted to make sure we were only conditioning (heating or cooling) the floors that we were on, when we were on them. It seemed to be wasteful to me to heat or cool the basement except for on the rarest of occasions. 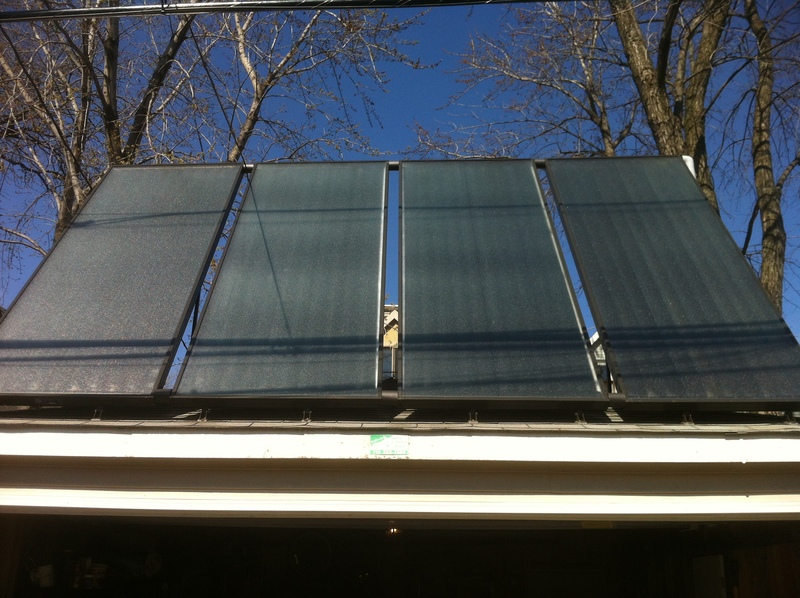 Four (4) 4′ x 10′ AET Solar Panels were installed on the garage. A 120 gallon storage tank to store the heat collected from the panels. I frequently get asked what our return on investment (ROI) for our solar system/s will be. We didn’t do it for a ROI, we did it because we want to get off (climate destabilizing) carbon based energy and help motivate more people to move in this direction. However, there is a tremendous ROI on this and a hedge against future energy price increases. This entry was posted in The Life. Bookmark the permalink.